Tune in to WDR 3 Thursday at 2:05 p.m. EDT to hear Alan Gilbert lead the Philharmonic in the World Premiere of Peter Eötvös’s Senza sangue — a lurid tale of revenge and reconciliation, featuring mezzo-soprano Anne Sofie von Otter and baritone Russell Braun — plus Esa-Pekka Salonen’s Nyx and Bartók’s The Miraculous Mandarin Suite. The concert was recorded in May from Cologne, the final stop of our EUROPE / SPRING 2015 tour. If you miss the broadcast (or want to listen again), the concert will also be available on-demand for the next 30 days here. The EUROPE / SPRING 2015 tour has come to an end, and the Orchestra has been greeted by friends, family, and some real spring weather (finally!). It was a terrific tour in every way, and we thank everyone who welcomed us, hosted us, performed with us, and attended our concerts. We especially thank Exclusive Tour Sponsor Credit Suisse, whose support made it all possible. To see slideshows and videos, go here. Here's what the press had to say. Frankfurter Allgemeine Zeitung wrote that the performance of Strauss's Der Rosenkavalier Suite, particularly the horn section, made the concert "worthwhile already," and Ravel's Shéhérazade was played with "an enchantingly concentrated atomosphere." The EUROPE / SPRING 2015 tour comes to a rousing conclusion, with Alan Gilbert and the Philharmonic performing in Frankfurt and Cologne, including broadcasts and a premiere featuring Anne Sofie von Otter and Russell Braun, as well as festivities courtesy of Exclusive Tour Sponsor Credit Suisse. The result? Pieces of music that would be performed by an ensemble of New York Philharmonic musicians and Guildhall School of Music and Drama graduates on our freeStage during the New York Philharmonic Residency. The Barbican spoke to Graydon Hanson, one of the Philhamonic Very Young Composers, who gave a composer's eye view on the process. Check it out! 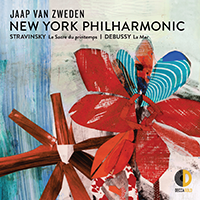 Alan Gilbert and the New York Philharmonic made history as the first American orchestra to perform at the new Philharmonie de Paris, a concert available as a free webcast through medici.tv, following boffo performances in Amsterdam and Luxembourg on the EUROPE / SPRING 2015 tour.